As organizations look for new ways to engage increasingly disengaged employees, environmental graphics—what used to be a workplace design afterthought—is now a vital part of how an organization tells its story to customers and employees alike. Still, if you’ve never worked in an office with stellar environmental graphic design, it may be hard to understand how these graphics add so much value. However, before we dive into a few examples of how environmental graphics inform, entertain and inspire, let’s do a quick review. 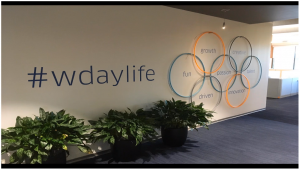 In the graphic pictured below, in addition to inspiring employees who walk by it, this multifunctional environmental graphic also entertains. If you look closely, you’ll notice that the colorful rings bordering each word on the wall are actually hula hoops. Should an employee need to take a quick break and reset, they can grab a hula hoop right off the wall for endless entertainment. Colleagues can also join in the fun, creating an atmosphere that encourages a playful, more creative workforce. Inspiration often strikes in what seem like the most unlikely moments—in the shower, at lunch, or during an informal conversation with a colleague. This is one of the things that makes thoughtful environmental graphic design so valuable. Pictured above, what would be just a wall is transformed into a place to brainstorm and collaborate, formally or informally. 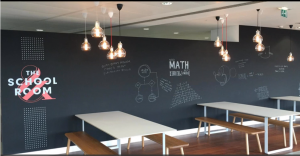 Using the chalkboard, employees can get out of their normal routines with a working lunch and illustrate ideas and concepts for each other. In this way, environmental graphic design inspires unique insights by providing a space that enhances collaboration. 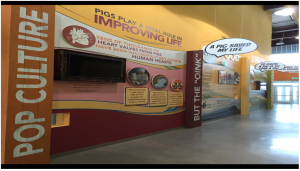 Environmental graphics at the exhibit pictured below delight and educate visitors about pig and beef farming. The graphics combine visual representations with educational statistics to help visitors quickly understand the farming process. This thoughtful design helped the client achieve their goal of being fully transparent with consumers. The graphics helped them do so by bringing people in and teaching them about where their food comes from as well as the manner in which the business practices sustainable farming. As you can see from the examples above, environmental graphic design is much more than throwing a few pretty pictures and letters up on the wall. It can actually change the way people think, how they interact with the space, and how they collaborate with colleagues. Additionally, environmental graphics that create a more innovative workspace can act as a recruiting tool for your company. So if you’re starting to feel inspired and would like a deeper dive on environmental graphics, watch this webcast featuring Scott Swedler, a Graphics Project Manager with RIOT Creative Imaging, an ARC company, with 11 years of environmental design experience.